Many cookbooks have a chapter devoted to specialty shops so one can obtain the desired ingredients for the recipes within. Some books basically require all of the ingredients to be bought from such stores. 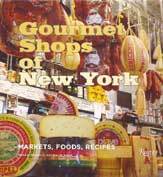 Now Susan P. Meisel and Nathalie Sann bring you a welcome reversal of sorts with their new book Gourmet Shops of New York: Markets, Foods, Recipes. Mrs. Meisel hails from New York and owns a catering business. Mrs. Sann, a native of Paris, is a former culinary professor and present resident of New York City. By reversal I mean the following: You buy a book and in order to make the recipes you need to buy ingredients from stores that may or may not be simply online-stores. Now, with Gourmet Shops of New York, we are offered a glimpse into living, breathing specialty stores from which one can endlessly create wonderful dishes, and/or obtain the necessary ingredient for one’s favorite recipe. I love America and am an American but, after living in Paris for many years I do miss the small specialty shops I frequented. The book is divided into five major sections each named after one of the five boroughs in New York, including indexes of shops by neighborhood and category. We’ll start in Manhattan, Greenwich Village to be exact, with a Gigot de Sept Heures (Seven-Hour Lamb) from the Florence Meat Market. Simple, straightforward, but if you want results for the finished product you need to start with the best. The Bronx brings us to Borgatti’s pasta and Pappardelle with Fresh Morel Sauce. Just the thought of fresh peas, morels, garlic and freshly grated Parmigiano-Reggiano in a cream sauce makes me hungry. In Brooklyn, at Bierkraft you’ll find cherries plumped in beer to make their famous Bierkraft Cherry Blondies. In Queens, at Empire Market you’ll find old-world German charm without having to buy a plane ticket. You can indulge in a large variety of smoked meats. We’ll end our tour on Staten Island at Royal Crown Bakery and the thought of fresh cannolis and espresso.